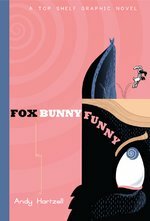 Fox Bunny Funny is Andy Hartzell's first graphic novel. Recent short works have appeared in anthologies such as Papercutter and Boy Trouble, and his self-published minis can be found at hobocomics.com. A resident of the San Francisco Bay Area, Andy works as a designer at Telltale, where he writes and directs episodic adventure games ("Wallace & Gromit", "Sam & Max").